Your new stone surface is a work of art and an investment. It is worth your while to learn the proper way to care of it so that it gives you a lifetime of beauty and use. A number of the following general guidelines are from the Marble Institute of America: www.marble-institute.com. Dust your surface regularly to remove loose debris that could scratch the surface. When selecting a cleaning product for regular use, avoid scouring powders/creams, grout cleaners, acids (vinegars, citrus), ammonia, and rust removers (hydrofluoric acid). Great Lakes Granite Works recommends Method Daily Granite Cleaner: http://methodhome.com/products/daily-granite-28oz/ as a good all-purpose neutral cleaner for stone surfaces. Clean stone surfaces with a few drops of neutral cleaner, stone soap (available at hardware stores or from your stone dealer), or a mild dishwashing detergent and warm water. Use a clean soft cloth for best results. Too much cleaner or soap may leave a film and cause streaks. After washing with a soap solution, rinse the surface thoroughly and dry with a clean, soft cloth. If you have a spill, blot it with a paper towel immediately. Don’t wipe the area; it will spread the spill. Flush the area with a mild soap and water mix and rinse several times. Dry the area thoroughly with a soft cloth. Repeat as necessary. 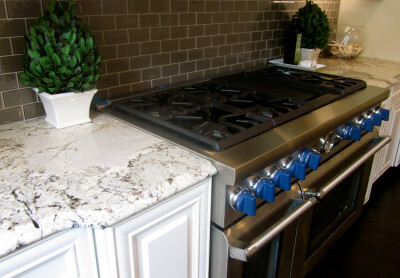 If the stain persists or you have a stain that is too difficult to treat, call Great Lakes Granite Works. To remove soap scum, use a non-acidic soap scum remover, or ½ cup of ammonia to a gallon of water. Ammonia can be used occasionally, but frequent use can dull surfaces. Follow any additional care and maintenance guidelines you receive from your stone manufacturer, or visit the product’s website for more information. Man-made and engineered surfaces do not require sealing, and can be cleaned with a mild cleaner and soft cloth. "The installers were excellent! They were very professional… arrived on time and stayed on the job the entire time they were here. The job was finished within the approximate time they had quoted. The marble is beautiful! They cleaned up after they were finished and both installers were very pleasant and courteous. We plan on using them again in the future."